Looking for a florist to deliver flowers in Lewis Center? 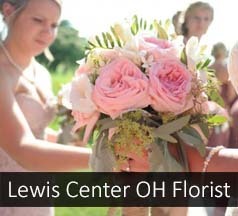 Flowerama offers same day flower delivery and same day express flower delivery to Lewis Center, Ohio. We have won the award for the best flower shop in Columbus six straight years, we have four real brick and mortar locations, we have a great web site and great pricing. No wonder people choose Flowerama over and over again when they need flowers delivered to Lewis Center. We even named one of our arrangements after the city called "Lewis Center Garden Promenade". We also provide daily flower delivery to Lewis Center businesses, and Lewis Center nursing homes.